Besides just driving the 2016 Mini Clubman to see if it was any good or not, two reasonably sane, well-adjusted adults spent a large chunk of time in it trying to satisfy a picky, grumpy cartoon fish. The cartoon fish in question comes up when you put the new Clubman into “Green Mode” and select the MINImizer. The MINImizer then reacts to how well you hypermile your car to encourage you to drive in a more eco-friendly, gas-saving manner. It does this by giving you a graphic of a fish in a bowl on top of the car. Travel over a certain speed and the fish will be knocked out of his bowl. Given that this particular car was shared between myself and 24 Hours of LeMons race-buddy W. Christian Mental Ward, I had a theory that this MINImizer fish had been secretly judging us before we got bored on the freeway and started messing around with the inner workings of the car’s infotainment system. Racers! It must have said, knowing we were a pair of gas-guzzling, fish-devouring, eco-unfriendly hoons. Already things were off to a rough start. 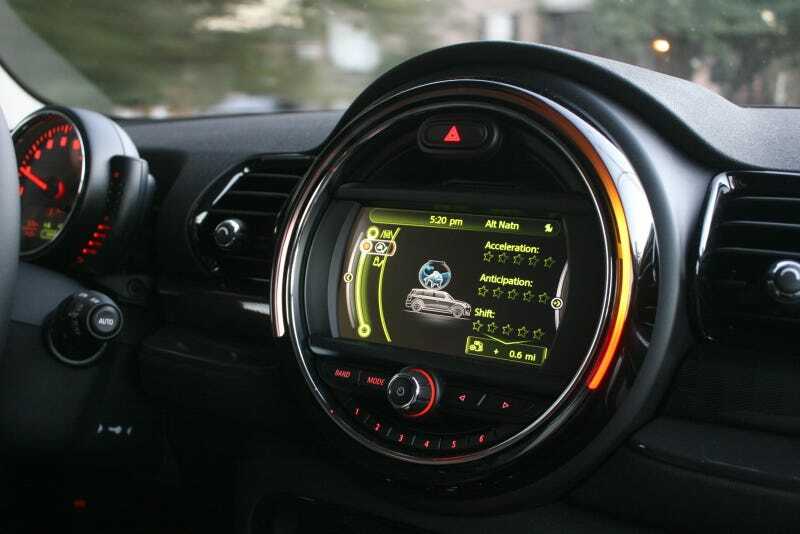 Much of the design of the Mini’s infotainment system, largely a re-skinned version of BMW’s latest iDrive, is great. Most of the print is large and simple enough to glance over at easily from the two front seats, save for perhaps the overexplained descriptions of the different traction control settings. The clean design of the menus makes it easy to use. Cute illustrations that you wouldn’t expect, such as the car thinking of a go-kart when you switch into Sport Mode, make it a delight to thumb through. The only problem is that some of these illustrations can be a bit distracting. We named ours “Fishie,” because that’s exactly the kind of name for a fish that you’d expect from a car that had “Fluffy Bunny” riding in the car. First, I discovered that it was incredibly easy to fling the fish out of its bowl. The limit for what the Mini deemed “too fast” was lower than the freeway’s out of town speed limit. We were probably ahead of schedule given the other drivers’ tendency to have issues reading directions, so I slowed down to try and satisfy the fish anyway. We were a moving chicane. Worse yet, Fishie kept his sad frowny face and not a single thing I could do could make him happy. If you accelerated too quickly, Fishie’s water would even slosh and he’d have a panicked look on his face. Poor Fishie! Slow down! Save Fishie! Occasionally, Fishie would pop on with helpful pointers on gears I should be in or things I should do. He’d lean out of the water with a suggestion in a thought bubble above his smug little head. That’s the only time we saw Fishie even close to happy, and it was more of a thoughtful face instead of a pleased one. I gave up on Fishie for a little while after I determined that driving at traffic-hindering speeds in the right lane felt a little unsafe, but I tried it out again once we were in heavier, slower city traffic. Our problems with Fishie persisted. No acceleration could be smooth enough, no gear could be high enough, and no coast could be long enough for Fishie to be happy. Fishie was unhappy even when we were stopped. Besides, will anyone use this feature? A Mini Cooper is a fun car to drive, but Fishie makes the experience decidedly not fun. Worst of all, I found that I was paying so much attention to this quaint fish doodle at times that I was doing a lousy job of paying attention to the traffic inch forward in front of me. That’s the biggest problem with Fishie. I can appreciate cute Easter eggs in a car’s menus, but when the cartoons on your center screen are so interesting that they grab your attention away from driving, it becomess a huge problem. Fishie’s real-time translation of hoon driving into disdain would be a fantastic, engaging design for a standalone app to be used by anyone who’s not driving, but in the context of a car, it’s a bit too much to process all at once. Maybe Fishie needs to sit and frown on a display directly in front of the driver. He’d be a bit redundant with the more traditional gauge there, but I know he’d still be frowning. Fishie always frowns.